Early on Jim writes that "The models grossly underestimated the mid century warming by as much a 0.5° C.". (H/t Dave.) He provides not one jot of evidence for that. He's way wrong. Does he think no-one would have noticed a model output being half way DOWN a chart with the observations left far above? Think how deniers screech that all the models are wrong when the observations are still within the band of models. After setting the scene, Jim goes ahead to demonstrate the non-sequitur. His main argument seems to be that because the Arctic has warmed in the past then humans can't be causing global warming. Jim has called upon Lennart Bengtsson (yes, the chap who had a short dalliance with the GWPF) to bolster his fantasies. Problem is that the paper he cites doesn't support what Jim wants to have you believe. Jim isn't much good with links - he didn't provide one. It appears to be a highly regarded paper, cited 250 times according to Google Scholar. The paper was co-authored by Lennart Bengtsson, Vladimir A. Semenov and Ola Johannessen and first published in 2003 as a report of the Max-Planck-Institut für Meteorologie before being slightly revised and published in the Journal of Climate - a top notch climate science journal. It is interesting to note that the ongoing present warming has just reached the peak value of the 1940s, and this has underpinned some views that even the present Arctic warming is dominated by factors other than increasing greenhouse gases. However, other authors concluded that the present warming in the Arctic is dominated by anthropogenic greenhouse gas forcing. The authors who believed the recent warming was due to rising CO2, presented their arguments in a separate 2004 paper Arctic Climate Change: Observed And Modeled Temperature And Sea-Ice Variability2, and their diagrams of modeled output provide a vivid illustration of how poorly natural climate change is modeled and how adding CO2 distorts observed climate reality. One thing that Jim neglects to mention is that the second paper was by the same three authors (including "IPPC's" Lennart Bengtsson) as the first paper he referred to trying to give the impression that "climate has changed before therefore it's not human activity causing the current warming". These three authors collaborated with nine other scientists in preparing this second paper. This paper was cited even more often than the other (553 citations according to Google Scholar). There are, of course, multiple factors affecting the current warming of the Arctic. Obviously the greenhouse effect is one major factor, but as the above papers (and others) point out, and as even Jim apparently knows (believe it or not), ocean temperature, wind, currents and ice cover all affect the surface air temperature of the Arctic. Figure 1a shows the time evolution of the zonally averaged anomalies in annual mean SAT from 30–90◦N. Two characteristic warming events stand out, the first from the mid 1920s to about 1940 and the second starting about 1980 and still ongoing. Here, we show that the early twentieth-century warming was largely confined to north of 60◦N, whereas the latter warming encompasses the whole Earth (Jones et al., 1999) but is none the less significantly enhanced in the Arctic (Fig. 1a). Jim posted as separate panels Figure 1 from Johannessen04, which is shown below. I've added some lines so you can more easily line up the warm periods. As always, click for larger view. (d) modelled, control run, which generates temporal and spatial scales of variability, although the particular years on the x-axis are, in effect, arbitrary. The model results (b–d) are from the ECHAM4 coupled atmosphere–ocean–ice model (Roeckner et al., 1999). ECHAM4/OPYC is a state-of-the art coupled atmosphere–ocean–ice model developed by the Max Planck Institute for Meteorology and the German Climate Computing Centre. It has been used extensively in climate modelling by several research groups worldwide. The atmospheric part is a spectral transform model at T42 resolution and employs 19 vertical levels. The ocean part uses isopycnal coordinates at 11 vertical levels. In their “control run” below (Figure 1d), they included all the known physics believed to affect climate change except anthropogenic greenhouse gases and sulfate aerosols to produce their representation of “natural climate change.” The result as seen in Figure 1d, was a relatively warmer period that lasted for about 15 years. However more importantly, the simulated warming was produced only after 150 years of integration and never corresponded to either of the warm periods between 1920 and 1950, or between 1980 and 2000. So the authors randomly placed the modeled warming on the timeline. Here, a similar high-latitude anomaly, although less extreme and of a shorter duration, is found in a 300-yr control run (without increasing anthropogenic forcings) with the ECHAM4model—100 yr are shown in Fig. 1d. Jim either didn't comprehend the paper or he was being deliberately deceitful. I'll opt for the former because previous experience with the chap suggests he suffers a cognitive disorder when it comes to climate science. In other words their models failed to reproduce the observed climate change – whether it was natural or anthropogenic. As you can see, both 1b and 1c do produce the modern warming, reasonably closely with, though not exactly the same as, the observations. Figure 1b produced some, but very little of the 1930s warming. Figure 1c produced no 1930s warming at all, which is why the authors decided that the 1930s warming was from natural variability not anthropogenic forcing. In contrast, no comprehensive numerical-model integrations have produced the present global warm anomaly (Fig. 1a) without including observed anthropogenic forcing. Figure 1b shows the ECHAM4 model simulation with anthropogenic GHG forcing. 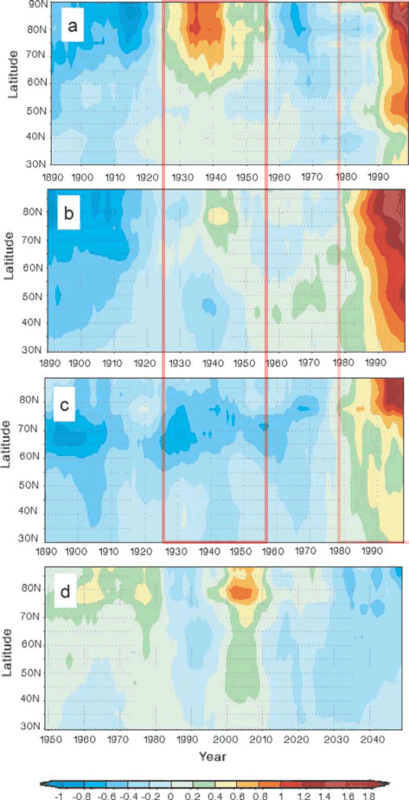 The patterns compare well with the last two decades of observed warming, although the modelled warming occurs slightly earlier and also encompasses lower latitudes than observed (Fig. 1a). The patterns from a simulation including GHGs and sulfate aerosols (GSD) (Fig. 1c) show that, although the recent midlatitude warming is underestimated, the high-latitude enhancement is in agreement with the observations and other modelling results (Raisanen, 2001). Therefore, anthropogenic forcing is the dominant cause of the recent pronounced warming in the Arctic. In order to “prove” CO2 has caused the recent warming, they added the historical rise in CO2 to their models. And voila! They reported massive warming in the 80s and 90s. Simultaneously however their models did something quite revealing. Yes, that's exactly right. Without any anthropogenic forcings the warming isn't evident. Jim, that is wrong. 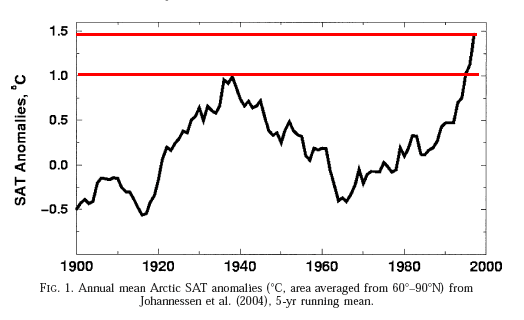 Lennart Bengtsson and his co-authors on their second paper did not ignore the "eradication of earlier warming". What they concluded was that the earlier warming was not from greenhouse gas forcing but from natural variation. The current warming, by contrast, can be attributed to greenhouse gas forcing. And what was that about non-sequiters? Jim is basically trying to argue that because, as the scientists themselves demonstrated, the 1930s warming wasn't attributable to human activities then the current warming can't be either. Jim Steele needs to read up on the meaning of non-sequitur and re-read the articles at SkepticalScience.com. What's with the "since 2003"? That's only eleven years ago. Not much of a time span to consider climate shifts. In any case, the USCRN data only goes back ten years and there is no clear trend yet. The R2 value of the linear regression is 0.0024, which means that the decadal trend of minus 0.1°C a decade is inconclusive at best. As for ocean heat, contrary to Jim's claim, the top 700 m are warming. So is the top 2000m. The oceans are heating up because of human activity. Global surface temperatures are rising. All the surface temperature and tropospheric temperature data series show warming over the past few decades. As for "since 2003", the UAH satellite data is also inconclusive with the R2 of the linear trend line being only 0.0066 on the monthly chart. RSS shows a slight downward trend since 2003, but again with a very low R2. Here's is a five-chart animation to show what I mean. If you're interested in what people from past decades thought about Arctic warming, you might like to read some of the newspaper articles I've collected. As expected, there's a lot of "'rah, 'rah-ing" going on. Anyone who rejects climate science gets a loud cheer at WUWT. That's why deniers flock there. I'm not sure how many WUWT-ers picked up that a lot of Jim's article was about climate change in the Arctic, not about global warming. Only one person challenged him and Jim jumped down his throat quick smart. Skeptical Science is making the error of confusing positive arguments with rebuttal arguments. The reason skeptic bring it up is because the warmists assert the opposite. How many times has some article breathlessly talked about temperature increases unparalleled in history? The warmist make the assertion, because their direct arguments are weak, but if they can demonstrate that something like this has never happened before, their audience will be sympathetic to the view that there must be human involvement this time. Skeptics do not raise the rebuttal to prove that warming must be natural, skeptics raise the argument to demonstrate that warmist are wrong! And why is it a common argument? Because despite the evidence, the warmists keep making the claims. biology certainly will reduce a nutrient to limiting levels…. Mother nature keeps calling the alarmist liars. Which probably makes them even more angry since they cannot sue her in court. Just a couple of notes about the Arctic. Both you and the warmists simply don’t bother to learn about what is happening there. The warmists lump Arctic warming with global greenhouse warming and are happy that they found that warming. And you have no idea that Arctic warming started suddenly at the turn of the twentieth century. Prior to that there was nothing there but slow, linear cooling for two thousand years. The start of the warming was sudden and there was no parallel increase of atmospheric carbon dioxide which rules out the greenhouse effect as its cause. Bengtsson did note the start of the warming correctly but did not get the follow-up. It is highly likely that the sudden start of warming was caused by a rearrangement of the North Atlantic current system that started carrying warm Gulf Stream water into the Arctic Ocean. Record shows that this warming was interrupted by a thirty year cooling period in mid-century, then resumed, and is still going strong. It is quite impossible for greenhouse warming to switch from warming to cooling and back again. All that warming is still counted as greenhouse warming by global warming activists when in fact it is nothing of the sort. Direct temperature measurements near Svalbard indicate that the warm water reaching the Arctic today is warmer than anything seen there within the previous two thousand years. You hear much speculation about why Antarctica is cooler than the Arctic is today but the vital fact that it is because of the warm Gulf Stream water carried north by currents is simply buried in their ignorant speculation. Fact is, if this warm water did not get carried north both poles would be at the same temperature today. Here is your homework on the subject: read E&E (22)8:1069-1083 (2011). The comments above are chock full of scientific error. Notice how the mod gives a pass to endless brainless comments but insists on "examples" if they think there's a chance that someone might be criticising a fake sceptic. The example is silly because we have firm evidence what killed the man, IE, the knife in the back. On the other hand we have nothing but suppositions as to what has caused the warming of the last century. The warmists assert that it must be CO2, because that is what their models tell them. Another thing that is irksome about “climate myth #1″ on SkS is that they offer no real explanation about major climatic events from the past. Could they tell you exactly what caused previous ice ages? Or why the earth came out of them? Of course not. If you want to tell people that climate change now is different than in the past you need to explain the past and demonstrate why the present is different. You can’t just say “humans are putting more CO2 in the atmosphere so it’s different now” because you have an imprecise understanding of the major historical drivers of climate and how the present CO2 situation affects them, if at all. I have read articles about climate models that fairly accurately track the past for at least the last past 200 years and also predict the end to the late 20th century cooling cycle. These models depend on total solar activity and the effects of the oceans. They do not include any CO2 effects. In reality there is no real evidence in the paleoclimate record that CO2 has any effect on climate, just conjecture. If greenhouse gases have been involved in climate change then the lionsharere must have been caused by H2O. Another great myth is that the climate models were built based upon a solid, scientific understanding of how the climate works. Instead, the models were built on a premise — that greenhouse gases, specifically human CO2 emissions, are driving global warming. We are only beginning to understand how the climate works and how the multitude of factors interact. Repeat, the climate models are not built upon that limited scientific understanding of how the climate works, but upon a theoretical belief that greenhouse gas emissions drive climate change. Argumentum ad ignorantiam. That their models don’t explain it without CO2 is not proof that CO2 caused it. It is an assumption of guilt. Wonderful graphics. Well labeled and demonstrative to even lay persons. It is nice to see someone attack a proposed hypothesis with data. In my opinion, of those that speak to climate in this blog, Bob Tisdale does a great job of this. Leif also. Anthony and Willis are in that group. Now you are in that roll call group at wattsupwiththat who are capable of lucid communication with the general public. No – one can remember 1920 so it is convenient for models to fail to history match at that time. It is much harder to dismiss a model that seems to match living memory which is the only thing most catastrophists rely on for their limited arguments. And I can find a complete, “mathematical basis”, including classic programming FLOW CHARTS for these “climate models”. Until that is publically available, NO MATTER WHAT RESULT they produce, they are FICTIONS, not real science. The sun heats the surface first. Then the warmer surface heats the air above. Ocean surface heat capacity is 4 times the mass specific heat capacity of the air, and is also 800 times more dense, thus has a total of 3200 times the thermal energy of the air. 2 cubic meters at the ocean/atmosphere interface, one square meter of ocean to a depth of one meter, and the one meter of air above it. To change the temperature of those two cubic meters by one degree, then you would need 3201 kilojoules of energy. One kilojoule for the atmosphere and 3200 kilojoules for the ocean. Is it so surprising to see a slight shift in the direction of the gulf stream current causing a huge change in the air temperatures of the arctic?? The stuff where they don't accept the SceptSci analogy with the dead man with a knife in the back is jaw dropping: I'd have thought even a nine year old could have understood that one. I'd have thought the same nine year old when told that they have been measuring the rise in CO2 at Mauna Loa for 50+ years now (and the Wutters are not supposed to deny CO2 is a greenhouse gas) would be able to figure out where the 'knife' is. Just how far down the intellectual scale are they aiming now? A nine-year-old isn't capable of self-delusion to that level. That can only be learned later in a child's development. Deniers don't get analogies. Ever. I've noticed this over and over and over. It's some kind of weird pathology. Some psychologist should study it. Does Jim suffer from a chronic cognitive disorder? He either can't understand simple graphs or is mischievously and intentionally deceptive. Is this how deniers roll? BTW. Brilliant take down Sou. If these guys actually started telling reality how it really is instead of resorting to their childish antics, they might actually be believable. Everytime I read a post on WUWT, they are revealed as charlatans. I mean, really. It doesn't take much to check their claims. A minute or so on Google. Yet this seems too much for your average denier. They prefer their lazy Morton's daemon to be spoon fed with lies and deceptions. Steele loves the words "straw man." He uses them in every post. He also never, ever, ever provides the original graphics in his rants. He always doctors them. I have asked him several times to provide me links to his peer-reviewed science papers, but he always changes the subject. Then his fellow trolls come on line and say that he can't get published because of the "science conspirators." I have even asked to see the papers he's provided to the journals, even if they're not published. Total crickets.